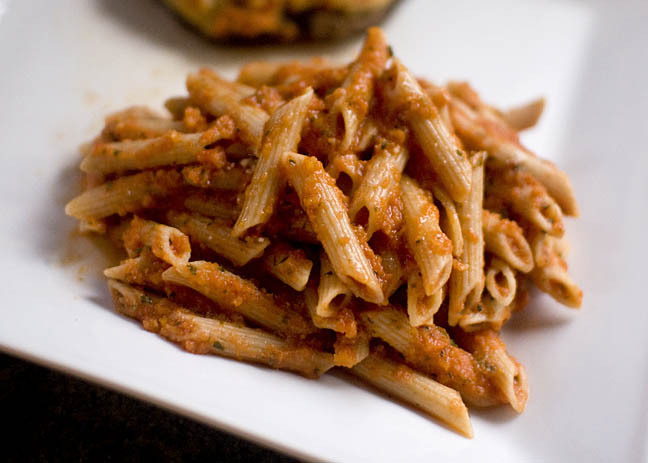 For a vegetarian, I don’t eat much pasta, but when I do, I often go for this tomato vodka penne. It reheats well, and it makes a nice workday lunch! Chop the tomatoes, reserve the juice. In a large saucepan, heat the olive oil and 1 T butter to melt. Add the carrot, celery, and onion; cook until tender. Add the garlic and parsley; cook 2-3 minutes, until the garlic is soft.Stir in the chopped tomatoes, tomato paste, bay leaves, oregano, salt, sugar, and vodka. Slowly simmer for 10 minutes, then stir in the milk. Bring to a simmer, stir in the basil, and simmer 20 – 25 minutes. Remove the bay leaves and blend until smooth (I use an immersion blender). Stir in the reserved tomato juice and return to heat. Stir in 1 T butter until melted, and serve over penne. I used whole wheat pasta here, and often do.